In this guide we’ll look at the best bird tables for the money. What Is The Best Bird Table? 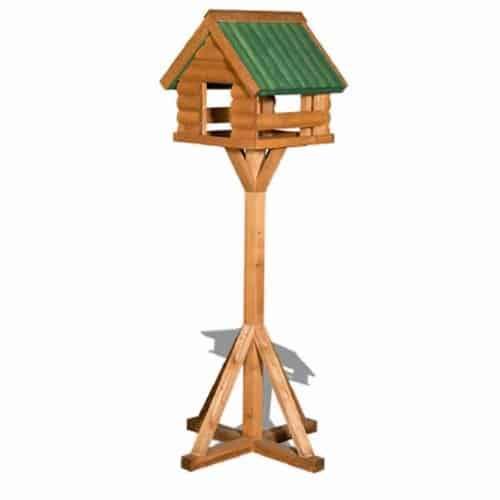 This Riverside Woodcraft Triple Platform Bird Table has one large feeding area at the top which is covered with a cute apex roof to keep the bird seed dry. The top part provides a feeding area of 60cm by 58cm. It also has two smaller tables lower down to provide extra feeding spots for smaller birds. The bird table is made of wood with a solid construction including a 3-inch heavy duty post. This makes it stable even in windy conditions. All the parts of the table are sturdy and well-made and put together in a strong and durable way. The robust construction means that this table will last for many years. The table comes with the top fully assembled and the stand in kit form. All fixings are supplied, and it is relatively easy to construct the stand and affix the top. This can be done in less than an hour. The birds in my garden took to this feeding table straight away and I found it easy to keep clean. This is a solid and durable large-sized bird table that looks great and will attract a range of birds to your garden. It’s one of the best bird tables that will suit all types of gardens. This Fully Assembled Fordwich Rare Bird Table is one of the best bird tables designed to attract smaller birds and provide them with a safe place to feed away from larger birds and potential predators. It has small openings that only allow the smaller birds to access the food. The table has a solid wooden construction and is made using FSC approved timber. The 4.5 height is designed to enable you to view the birds easily from a seated position. This makes it easy to sit indoors or on the patio and still be able to get a great view of the birds as they come to feed. The bird table comes in two parts and these are ready assembled. All you need to do is attach the top to the stand. The birds really took to this bird table quickly and the design means that pigeons and magpies find it hard to access the food leaving it for the smaller birds to enjoy. This is one of the best bird tables because it is easy to put together, looks great and is well built. It will provide the perfect dining arrangement for smaller birds! This Wildlife World Bempton Bird Table is one of my personal favourites because it features a really beautiful design. The latticework timber is finished in a pale green colour that goes perfectly with the real Verdigris copper roof. The feeder can be hung from a tree or fixed to a post and adds a lovely feature to the garden. This table is quite small which makes it is difficult for larger birds to access the food. The roof keeps the small birds safe from predators such as sparrow hawks as well as keeping the seed dry. The table features a pull-out tray which makes it easy to re-stock and clean. This is a delightful feeder that is a real feature in the garden and ideal for attracting smaller birds. It’s definitely one of the best bird tables available! This Riverside Woodcraft Sherringham Bird Table is another top choice of the best bird tables because it is made from solid wood and has a strong and stable stand. It also has a lovely slate effect roof that really does look like chunky slates but is actually more durable and easier to clean. The top part of the table comes ready assembled and the stand comes in kit form. All fixings are provided, and it is simple to construct. The only downside is that the actual feeding area is a little small. This is a solid and stable bird table that looks great and is easy to clean. This Natures Market Slate Roof Bird Table also has a nice design with a slate effect roof but is larger than the previous product. The product is constructed from sturdy wood which makes it durable and resistant to toppling in the wind. This table comes flat packed and will take a while to assemble, but the instructions are clear and all fixings are supplied. This Maypole Anti-fungal Heavy Duty Bird Table comes flat packed and ready for assembly and this is easy to do with clear instructions and all fixings supplied. It took me less than an hour to complete. The sustainable wood is chunky and durable and has been coated with an anti-bacterial Marcide coating to prevent the spread of disease. The top is of a reasonable size to allow plenty of space for the birds to feed. This is a well-made table that is attractive and offers great value for money. This Bird Table Feeder With Asphalt Shingles is one of the best bird tables because it features a really attractive hexagonal design with asphalt shingles and cute little window details. The wooden construction is sturdy, and assembly is straightforward. The design is reasonable compact and ideal for smaller gardens with the actual table surface being approximately 48 cm across. The small openings make it easy for small birds to access the food and discourages larger birds such as pigeon and magpies. It also has a central chimney down which the food can be poured. The table does not come with a stand. This bird house has a really cute design and is well made. Watching birds visit your garden is a delight and you can encourage them to visit more often with a well-stocked bird table. The best bird tables allow you to feed a range of birds with whatever food you choose to suit your local wildlife. The birds will be particularly grateful for the extra food from October to April when their natural food sources are in short supply. When the ground is frozen, or snow covered, a source of food from nature loving humans can literally be a life saver to British wild birds. When choosing from the best bird tables, you will want to look for a good solid design that is sturdy enough not to topple over in windy weather. A roof is a good idea as it will keep bird seed dry and prevent it from going mouldy. A roof can also protect birds from predators such as sparrow hawks. A large bird table will allow more birds to visit and reduce squabbling. However, tables with smaller openings can create a safe space for smaller birds where they don’t have to compete with larger birds such as pigeons, crows and magpies. For the safety of the birds, check there are no sharp edges which could hurt birds’ feet and no moving parts that could injure a bird. If there are a lot of local cats, consider adding a cat guard. Where should I position my bird table? In order to ensure that birds are comfortable coming to your bird table, you should place it in a quiet part of the garden away from paths. You should also position it so that the birds have a good view all around when they are using the table as this will protect them from predators. A small bush or tree around 2 metres from the table will allow birds to perch while they check that it is safe to feed. Birds also like to feed in a sheltered position that is out of chilly winds. How should I take care of my bird table? It is important to keep your bird table clean as a dirty table can harbour bacteria that can lead to disease. Every time you put out fresh food you should brush away any debris and clean the table with a mild disinfectant. You should occasionally move the table if possible, to prevent an accumulation of droppings beneath it which can harbour disease. If this is not possible, clear the droppings and disinfect the area from time to time. Once a year you should thoroughly clean the table and check it for damage such as splinters or loose joints. Tighten or replace any screws that have come loose or been lost. You can also treat the wood with a wildlife friendly preservative to help your bird table last longer. How can I attract birds to my bird table? One of the easiest ways to attract birds to your bird table is to put out high fat content foods that they will not be able to resist. You can use fat balls, cut up bacon rinds or grated cheese. Berries are also a great treat for garden birds. Put out food regularly and avoid putting out too much food at a time so that it does not go off or become contaminated before it is eaten. Putting out fresh water will also attract birds to the garden in dry summer weather or icy conditions and this can be a real life saver for garden birds. You can also attach hanging feeders to your bird table to attract a wider range of birds. You might also like to consider scattering some food below the feeder for birds that prefer to ground feed.